Eagle Waste & Recycling, Inc. is the contracted waste and recycling removal company for the City of Tomahawk. 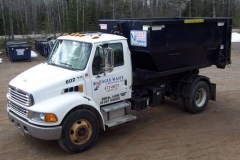 We are the premier company offering these services in northern Wisconsin. We specialize in residential & commercial services including clean out and construction boxes. For outstanding service and fair pricing please call us anytime for a free, no obligation quote at the number below.